An Illinois police officer was shot Tuesday morning, prompting a manhunt for two armed suspects outside Chicago, authorities said. Early reports claim the officer was killed, now Fox News reports the officer is only wounded. 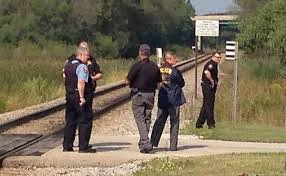 The police officer was shot near Fox Lake Il, about 55 miles north of the Chicago, Lake County Sheriff’s officials said. ABC7 reported the shooting occurred near an old cement plant. Police say they are searching for two men and possibly a woman. The Facebook pages for Gavin School District and St. Bede School in Ingleside said the schools are on soft lockdown. Residents should take caution and call 911 if they see anything suspicious.